Literally a carpet of bright green small leaves that spread rapidly in full sun to make a thick mat at about 1”. 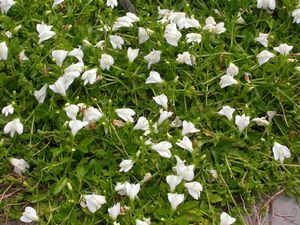 Moisture-tolerant, tough and hardy, Mazus sports white flowers in May and June just above the foliage. It works well in the rock garden, as an underpinning to roses, or between stepping-stones or pavers along a pathway. This is a strong grower and can’t be beat as a ground cover alternative.